As we near the end of January, Treyarch has released the next major Call of Duty: Black Ops 4 patch and it’s set to contain some important updates across the board. The last major patch for Black Ops 4 came with the v1.11 update on January 15, which saw the release of a new looting interface for Blackout and a new Zombies mode. While that update came with some noteworthy content, the v1.12 update looks to be even more impactful with the addition of a slew of new balancing changes and other major updates. The patch is currently live and weighs in at 6.94 GB on PS4 and 7GB on Xbox One. Could Ajax be next on the ban list for the CWL ruleset? What features will the v1.12 patch contain? Fans of the popular ‘Gun Game’ mode will be happy to hear that it’s back with a new selection that features the recently released Kap-45 pistol. Perhaps more importantly, though, Treyarch has teased further updates to the competitive side of things with the v1.12 update. Just prior to the release of the v1.12 update, Treyarch released a very detailed breakdown of their plans for League Play in Black Ops 4, which is now slated for release in "mid-February." Further, the Treyarch announced new updates to the CWL ruleset, which also included the recently hinted at banning of Ajax. Blackout players will be happy to hear about upcoming balancing changes. There are a number of major balancing changes to the game’s battle royale mode, Blackout, that will certainly please many fans. Everything from Level 3 Armor to Concussions to Cluster Grenades have received some highly-anticipated adjustments. 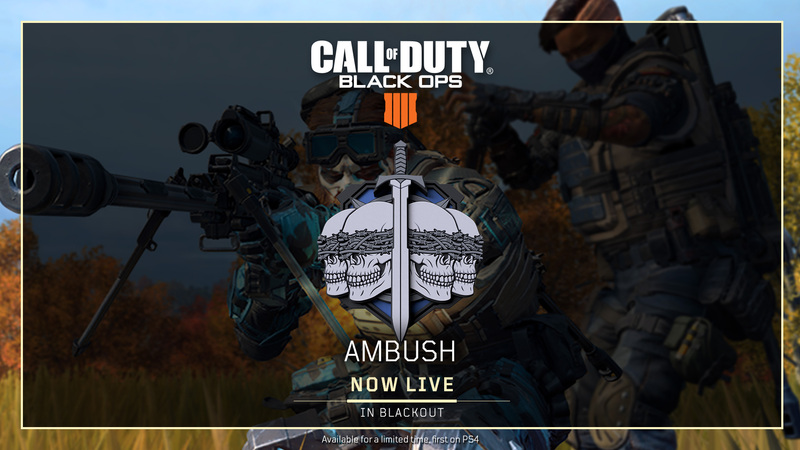 In addition to the new balance changes, the next limited-time mode, ‘Ambush,’ made its debut on PlayStation 4. The mode will feature a constantly closing circle and will only allow sniper rifles, melees, and launchers. Finally, Blackout players will at long last gain full access to camo progression. Including Mastery Camos. Treyarch said they will function differently than Multiplayer progression, meaning we should expect further details when the patch drops. A new Gauntlet is on the way for Zombies fans. Last, but not least, Zombies fans have received new weapons (MP 40, Grav, Daemon 3XB, SWAT RFT, and Kap-45) along with new camo progression just like in Blackout. A new Gauntlet titled ‘Vini, Vidi, Zombie!” on the IX map will also launch with the v1.12 update on PlayStation 4, with the PC and Xbox One release coming next week. Our 1.12 update starts rolling out today at 10AM PT on PS4 and Xbox One, delivering new content and gameplay improvements across all three modes of Black Ops 4! There’s a lot included in this update as we detailed in our preview last week, plus more planned for later this week, including Mastery Camos in Blackout and Zombies, full camo progression in Blackout, support for Mastercrafts/Reactive Camos/Black Market camos in Zombies, and Zero’s Outfit Unlock mission in Blackout. Our “Barbarians” Special Event continues on PS4 and kicks off today on Xbox One and PC, delivering 25 more Tiers of earnable loot, including the new KAP 45 full-auto pistol. This event stream appears below the Operation Absolute Zerostream in the Black Market, so players can unlock two pieces loot with each Tier earned during the event. We've incorporated feedback from the Call of Duty World League, pro players and some members of team management, and the larger Call of Duty competitive community, and today we’re announcing several updates to the CWL competitive ruleset, along with plans for the World League Hub and League Play.